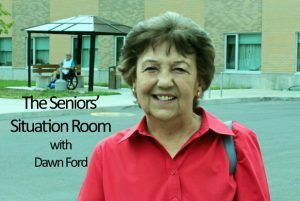 A very special senior celebrated her 95th. Birthday on Sept. 3rd. Happy Birthday to Ethel Bingley. Ethel is a wonderful lady and one that everyone who knows her likes and admires. Happy Happy Birthday Ethel. This Procedure Book has been in my trunk for many years. It was given to us as student nurses at the Cornwall General Hospital School of Nursing with a Forward by Evelyn Paul, Director of Nursing at the time. It says that the book was given to serve as a guide of nursing procedures which dealt with principles and techniques which were practised at that time at the CGH. I thought maybe that the first procedure of the 57 listed we would learn would be (TPR) temperatures, pulse and respiration. Not true. TPR’s were actually 25th. on the list. The first one is how to make a hospital bed. They had to be very neat and the open end of the pillow case had to face away from the door. We learned to make the beds with and without a patient in it. I had written dates on some of the procedures with notes. My first encounter with TPR’s was supervised by Miss Roberts and I did one adult and two teens. One procedure is called “Counterirritants and include a Mustard Paste which I think my Mom would have called a Mustard Plaster. It was No. 17 on the list along with a Mustard Food Bath. There was also a thing called a Linseed Poultice. Learning to give an enema came 13th. I remember the old nurse’s joke about giving it “high, hot and a hellava lot’. A nursing pal from St. Mary’s hospital in Montreal told me they used that expression also. It was just a joke because we had to attach a receptacle full of solution with a long tube to an I/V pole. Lot easier and simpler today. We also learned Massage Therapy. We used to rub the patients backs three times a day. We had little metal basins full of hot water and a bottle of alcohol immersed in it so the alcohol was warm. Must have been soothing and comforting for the patients. Today they use creams when massaging. And then the big one…giving a bedpan. That came early…#9. We were taught to warm it before placing. They have disposable ones today so I guess it isn’t a problem. 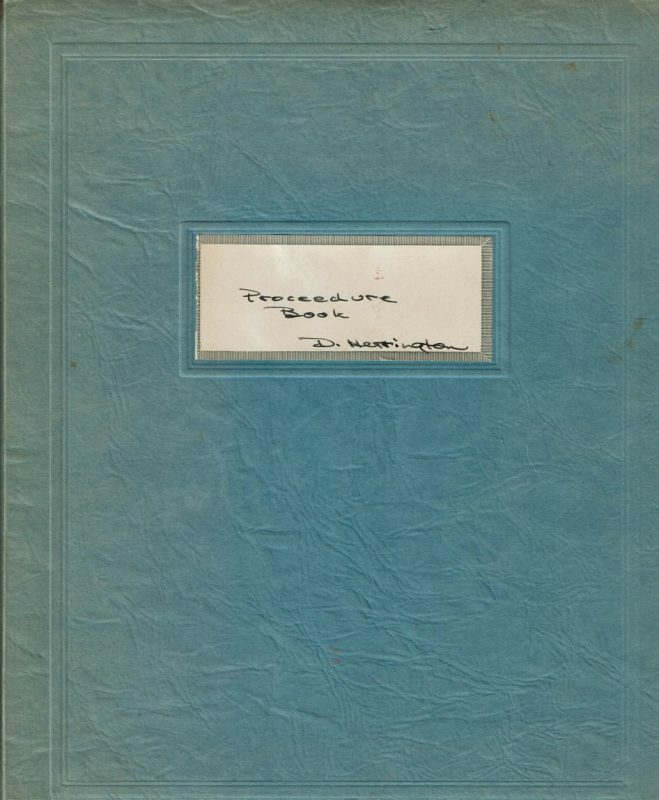 The Procedure Book brought back many memories of being young women learning to be a nurses. Remember the little booths where you could close the curtain, sit down and have your photo taken? I think they were in the ‘five and dime’ stores. There was one in the lobby when you first entered the East Court Mall. It was the only one left in town that I saw but it is gone now with the Mall changes. In Claude Macintosh’s very interesting recent column in the Seaway News, August 22nd, he mentions free milk for kids in 1970’s in the schools. Apparently the SD&G County School Board voted for free milk for kids in Kindergarten and Grades 1 and 2. It brought back some memories because we had free milk in our elementary schools in the late 1940’s and early 50’s. I especially remember at Memorial Park School in Grades 5 and 6 always making sure I got chocolate milk. Maybe it was started post-war for several years. I bought this book of hymns and their stories many years ago thinking I would learn to play on my guitar some of the old ones that we sang in the Sunday School at Trinity Anglican Church as kids. But life got a bit hectic around that time and I didn’t practice with the hymns very much. I rediscovered the book with my music recently and it was a pleasure to read the stories. In 1860 Anna B. Warner wrote, “Jesus Loves Me” with music by William B. Bradley. I remember that song because it says ,”Little Ones to Him belong” which as a child, I thought was wonderful. The other one I loved was ,” Jesus Loves the Little Children ” because the chorus said “All the little children of the world. Red and yellow, black and white, they are precious in His sight.”It was written by C.H. Woolston and Joseph Barlowe with music by George F. Root sometime before 1895. In the old Trinity Church Sunday School on Augustus Street where the Beek Lindsay Seniors Residence is located today, there was a big picture of Jesus surrounded by children and He is smiling at them. As a child I loved that picture. It signified to me that He loved all of us kids. There are so many interesting stories with the hymns including those of Christmas carols. One is of George Beverly Shea whom we all remember from the Billy Graham Crusades on TV. One hymn in particular became”sort of his signature song”, “I’d Rather Have Jesus” which was written in 1922 by Rhea F.Miller with music by George Beverly Shea. 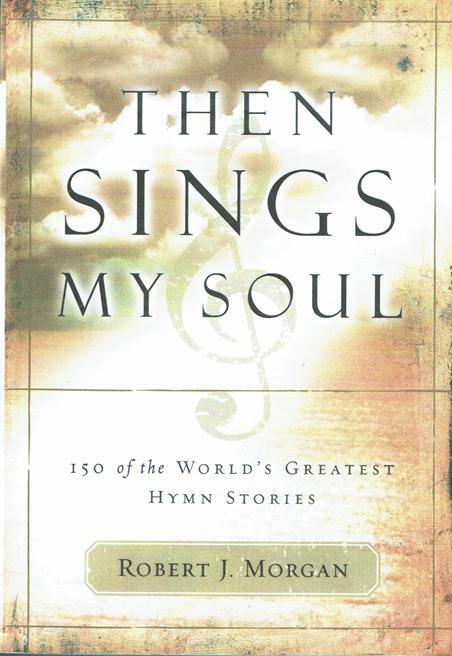 It is a wonderful book to read and enjoy all the stories of so many of our favourite hymns. Stand-off at the OK corral!! Bob Katz took this wonderful photo of a chipmunk busy eating out of a bag of peanuts with a very patient squirrel waiting nearby for his turn. 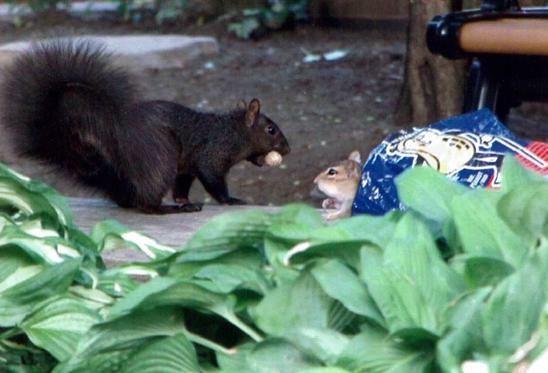 The chipmunk, cheeks full of nuts, got a big surprise when he came out of the bag to see the black squirrel in front of the bag. The little one took off like a shot!!! Cute photo. Thanks Bob for sharing it with us. 1) Haunted French pancakes give me the crepes. 2) A thief who stole a calendar got twelve months. 3) A dentist and a manicurist married. They fought tooth and nail. 4) A will is a dead giveaway. 5) Police were summoned to a daycare center where a three-year-old was resisting a rest. 6) I wondered why the baseball was getting bigger. Then it hit me. 7) The bicycle can’t stand alone. It is two tired. 8) The guy who fell onto an upholstery machine last week is now fully recovered. 9) He had a photographic memory but it was never fully developed. 10) When she saw her first strands of gray hair she thought she would dye.